What do we do when we decide it is time to downsize our collection? How do we even get started? We might decide we want to move where the snow doesn’t fly or that we simply want less to deal with. What ever the reason, the collection that seemed to have accumulated very easily and some might say ‘over-night’ can be a very daunting task when you are looking to scale down. AND then there are those ‘items’ you would NEVER part with….it can get complicated! 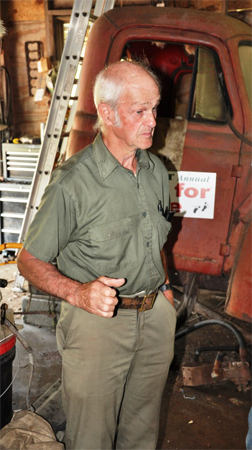 Stanley Lasell (pictured) of Williamstowm, Vermont wants to down-size. He started by asking some VAE members for help in deciding what parts of his collection should simply go to the crusher and some advice of value of what is left. Asking VAE members what should go to the crusher, it turns out, is a very simple answer….”Nothing”. We are just not built that way. Stan did get a visit by three of us with price books in hand and we hope we have helped him a little. This month’s WT will feature Stans collection and maybe force us to think about our collection in a different way. Wheel Tracks might just open other discussions with help on the subject. The blue car on the front page is a 1946 Nash Super 600. 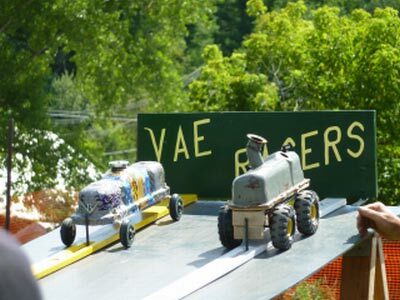 Stan said he sold it years ago but then it came back… The car is complete and the VAE team came up with a price of $1500.00 that Stan said he would accept. Some one out there, most likely, has been looking for this car for years and now you know who to call. BTW, Stan’s phone number is 802-433-5874. Stan’s first call was to the Wheel Tracks editor, Gary Fiske. He was trying to figure out how to down-size. I told him I have a lot of short comings when it comes to pricing old cars but I know two folks who could be of help. So, Gary Olney and Wendell Noble were invited to make the trip to Williamstown and Stan’s home. I had my note pad and camera…and I am sure we impressed the socks off Stan when we arrived. He is one of those “not-very-old Vermonters” who comes with down to earth common sense and the speech to go with it. “Bye and bye” was a favorite of his, I haven’t heard that said to me face to face since being with my grandfather in the 50s. Another regular comment was that Stan was going to “live forever….as long as he lives”. When he was describing the distance to his third car-yard….it was “ a loud holler from the barn”. Many of his treasures were “not for sale….but maybe”. We were up in Stan’s 2nd car-yard when Wendell asked him “What’s that over there”. Stan’s reply was “I was wondering that myself”. Most of Stan’s treasures were in high grass and among tress but as we get into the Fall his collection will be much easier to see. 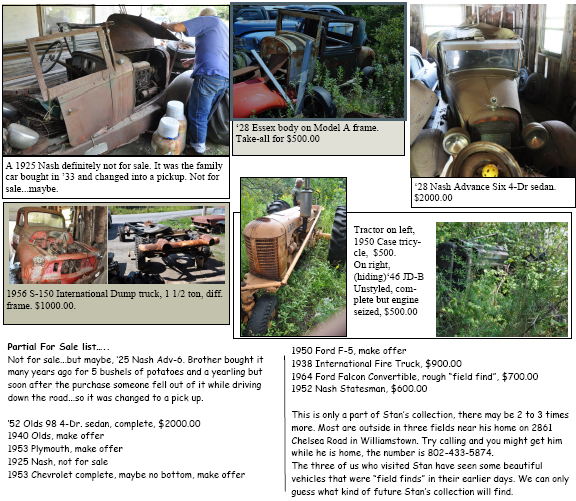 Here are a few of his vehicles he would like to sell. If we do not have room for all the pictures there will be a complete list for you to work with. Bob Chase and Duane Leach spends the year planning “The Antique and Classic Car Meet” in Stowe….then in 8 days the magic happens. Many others are involved but Bob and Duane are the sparks that ignite the largest car meet in Vermont and some say in New England. If you go to our website (vtauto.org) to the member only page and read the monthly minutes from their planning meetings , you will see the work involved to make the transition that you see at Nichols field for the three day car meet in August. You will also meet a few of the many people who work with these two gentlemen. Bob is a long time resident of Stowe owning a service station at the corner of RT 100 and the Mountain Road for many years. He and Wendy are presently key in making Mac’s Market a success on Rt. 100. Duane and Marnita move their RV onto Nichols field a week before the show, living there the entire time. Duane takes 2 weeks vacation from his job as a supervisor at Offset House, a printing company in Essex. Some of us think of our vacations differently but Bob and Duane have other ideas. The front page shows in a nut shell the dynamics of the two weeks at Nichols field. If you need to talk to Bob or Duane you will most likely have to wait your turn. This time it is Bob’s turn to wait…… he understands. You are looking at the lonely life of Pierre Pepin’s beautiful Blue 1922 Durant touring car. 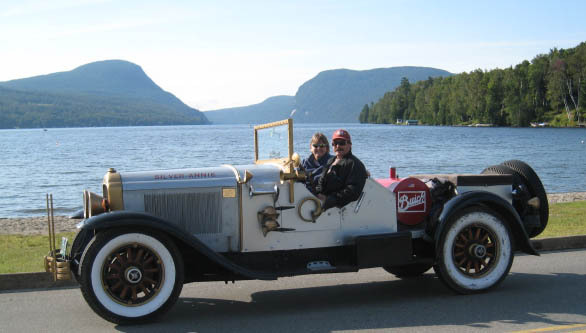 Pierre purchased the car a few years ago at the Stowe Car Show in the car corral. He traded a model A, or was that two, plus a little too-boot. He is a little sad that he has never had it on the road even though it appears to be ready to roll down the highway any time you ask. Pierre’s Durant made it’s way from New Jersey in 1997 to East Chelmsford, Massachusetts. From there to Stowe and then it’s present very quiet life in Colchester. The Durant was a make of automobile assembled by Durant Motors Corporation of New York City, from 1921 to 1926 and again from 1928 to 1932. Durant Motors was founded by William “Billy” Durant after he was terminated as the head of General Motors. Billy Durant’s intent was to build an automotive empire that could one day challenge General Motors. 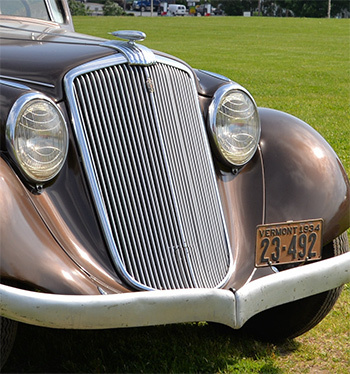 The Durant automobile is considered to be an example of an “assembled” automobile because so many of its components were obtained from outside suppliers. 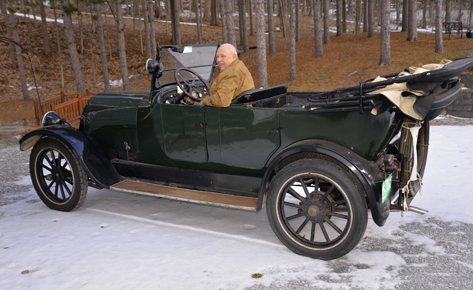 Pierre’s 1922 vehicle is powered by a four cylinder Continental engine. It is an overhead-valve type, fully encased. Bore: 3-7/8″, stroke: 4¼”; S.A.E. rating 24 horsepower; brake horsepower at 1800 r.p.m. 35. 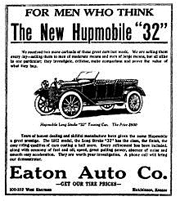 Durant vehicle production was suspended for the 1926 and 1927 model years. When the Durant was reintroduced, the car was redesigned and powered by a six cylinder Continental engine; some of the early vehicles were marketed as the “Durant-Star”. Bodies for the vehicle were supplied by Budd Company. In 1930, some Durants were built with all steel bodies, also supplied by Budd. Durant Motors was found insolvent and automobile production ended early in 1932. Wheel Tracks can not find a Durant that has been for sale in Hemmings Motor News in the past 6 months and when going on the internet none can be found for sale there either. The “Durant Motors Automobile Club” website offers a lot of information but again, Wheel Tracks found none for sale. Does that mean Durant Cars are hard to find if you would like to own one? Ken Squier’s Plymouth came to him in parts and had spent many years in the garage of former owner Stewart Raydell of Williamstown, VT. Ken is very fast to say that he has had very little to do with working on the project. His step son-in-law, Sandy Thompson, has taken on all the wood related work between his obligations at his business building staircases and handrails at his company in Stowe. Most of the wood is ash and it appears Sandy has done a better job than the 1932 factory workers. The mechanical work is being done by Gary Scott of East Barre. Gary has his own garage business and has a long history of working on Ken’s projects. Mr. Raydell’s neighbor, Steve Stephenson, remembers the car and told Wheel Tracks that he was the person who rebuilt the engine some 15 years age. At one time not too long ago there was a plan to have the car completed for the 2014 Stowe Car Meet this August but they all agree it might now be the 2015 meet instead. They have a ways to go yet. Ken Squier has a ‘bit’ of a history of being around cars and got started when he was 12 announcing sport events on his dad’s Waterbury radio station, WDEV. He was well known for his skill announcing live play-by-play dirt track races in Vermont during his younger years. His early Vermont announcing booth was an old logging truck. In fact he became so involved that he was able to convince NASCAR and CBS to get together and then basically created an announcing job for himself with CBS for many years. He announced every Daytona 500 race from 1979 to 1997 using his ’special style’. He often described NASCAR drivers in his era as “common men doing uncommon things” and describing wrecks as “side over side, end over end” for flips and for calling wrecked racecars with the phrase “all torn up”. A battle for position involving a large pack of cars would periodically be referred to as “an Oklahoma land rush.” Ken is still very active in the sport today. The family farm where I grew up in Milton had two tractors, a 1942 John Deere B and a 1929 Farmall F20. The F20 had steel wheels but was later converted to rubber tires making for a smoother ride and easier for the town road crews. I couldn’t wait to drive these tractors and finally when I was nine my dad agreed to show me how. That led to many hours of plowing, harrowing, planting, haying, sugaring, manure spreading, etc. Later, in 1959 Dad purchased a JD 435D, John Deere’s first venture into a small diesel tractor. This tractor had an engine built by General Motors, was made for only two years and is very collectible. That year, 1959, was the year I graduated from high school and left the farm eventually forming my own construction company where I still work. 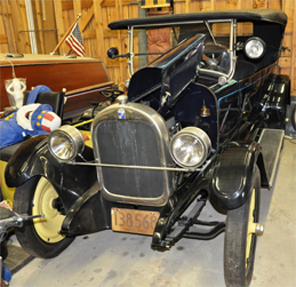 My interest in restoration started with a 1928 IHC 6-speed Special truck that I found in Stowe in ‘76. I still drive and show it. 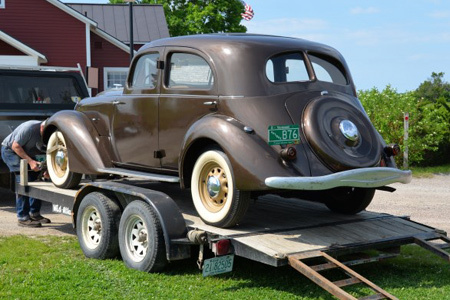 Anyone wanting to do restoring should be ready for the cost of finding the parts needed all over the U.S. on top of the many hours it takes to do the work. It also helps to have a partner involved. My wife, Velma, is very interested and involved in my projects which makes the work very much more enjoyable. Our first tractor restoration was the JD-B that I purchased in the 80’s pictured above and on the front page. Then we did the JD 435D and after that the 65 F100 Pickup. 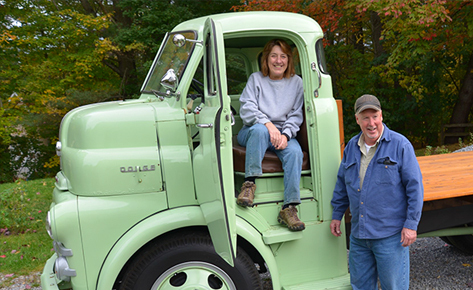 We are very proud that our 65 F100 pickup went on to win the VAE’s restoration of the year in 2010 and 1st place in it’s class at the Stowe Show in 2011. We found a Farmall F20 during one of our VAE tours in New York and ended up bringing that home for a face-lift. Our present project is a ‘69 Ford Dump truck (shown on page 16). The JD 435D is the tractor from our family farm and I also have a 1960 JD 1010 crawl-er that my uncle had on his farm. Velma and I belong to two tractor clubs (listed below) and enjoy many events including the Maple Fest parade, June Dairy Day, tractor pulls, field days, plow days, corn harvest and the Applefest. This year the Northeast Two Cylinder Club will be hosting the New England John Deere Expo VI in New Boston, NH on August 22nd, 23rd and 24th. The main feature will be JD tractors in the number series from 1953 to 1956. For example, in 1953 the JD40 was built and there were 8 to 10 variations in that series….wide and narrow front ends, low and high crop, etc. So between 1953 and 1956 there were series 40, 50, 60,70 and 80’s with many variations of each. The club is also inviting pre-1960’s International tractors (Farmalls) to join our Expo as Special Guests. People we meet in the tractor clubs are in the most part farmers or from a farm background but there is no prerequisite. Tractors are very interesting and fun; everyone is welcome. Karmann Ghia is 60 years old…..When Wheel Tracks learned that 2013 was the Volkswagen Karmann Ghia’s 60th anniversary we thought it was a good idea to feature the car for our May issue. We asked club members for input and maybe even some stories about their Karmann Ghia’s they presently own or have owned in the past. The results was a surprise. There are only two listed in our VAE Roster and that appears to be it. WT has heard of a number of VW Beetle stories but we assume no other members own or have owned a Karmann Ghia. 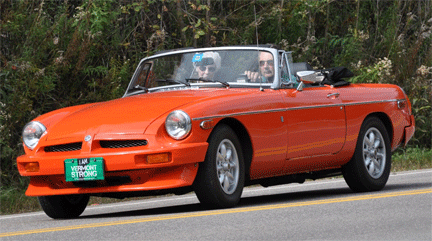 Our front page Ghia is owned by Ken Taplin of Blue Hill, Maine. 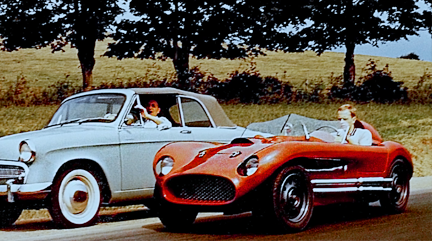 The second Ghia, pictured to the right, is owned by your editor in Enosburg, Vermont, a 1968 Coupe. 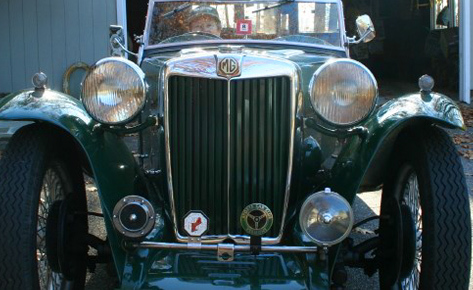 Ken has owned his convertible for only a few years since he purchased it at the annual “Owl’s Head Transportation” auction in Maine. He had an older Ghia when he moved to Maine in 1967 and that spurred him to bid on one of the three that were in the auction. He has 25 antique and classic cars and drives most of them. 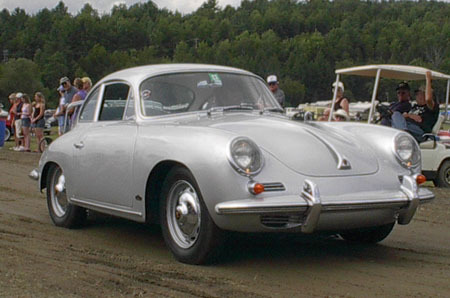 If you check the roster you will see he is partial to air-cooled cars, his latest is a 356A Porsche coupe. 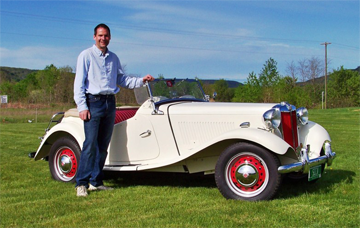 He drove the Ghia to our 2011 Stowe Show where the front page photo originated, that is Ken pictured with the car. 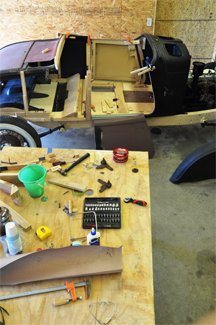 From Ken…” I saw Wheel Tracks mentioned the ’46 Beetle I had in college. One of the many cars I should have kept, with it’s mechanical brakes and semaphore turn signals but you can’t keep them all. Another one I let go was a ’27 Minerva limo. I did keep the first two cars I owned, a’31 American Austin coupe and a ’29 Franklin 4dr”. Here is some history from Ronan Glon…. Volkswagen is celebrating the 60th anniversary of the Karmann Ghia. Nicknamed the Beetle in a sport coat, the car was previewed by a close-to-production concept that debuted at the 1953 edition of the Paris Motor Show. The Ghia came to life when coachbuilder Karmann asked Ghia designer Luigi Segre to draw a new body for the Beetle. Operating with-out input from Volkswagen, Karmann believed there was a market for a sleek and sporty convertible based on the cheap and readily available Beetle chassis. For reasons that remain unknown, the convertible body style was scrapped and the first prototype took the form of a coupe. Segre presented the car to Karmann execs in a small Parisian garage in October of 1953 and although it was not the ragtop the men had imagined, they were thrilled with the result and proudly presented it at the show. The Ghia was generally well-received by the press and by visitors. Volkswagen chief Heinz Nordhoff examined the car inside and out shortly after the show. He was impressed with what the Beetle had spawned, but he feared the coupe would be too expensive to mass-produce. Karmann proposed to build the coupe alongside the Beetle convertible in its own factory and the Ghia was quickly given the green light for production. The Karmann Ghia was launched across Europe in early 1955 after undergoing only minor changes in its transition from a show car to a production vehicle. It was powered by a rear-mounted 1.2-liter air-cooled flat-four lifted straight from the Beetle parts bin. The convertible that Karmann had initially en-visioned was finally added to the Volkswagen lineup in 1957. Positioned above the iconic Beetle, the Ghia enabled Volkswagen to reach a trendier target audience while boosting its image across Europe and on the ever-important United States market. The Karmann Ghia was phased out in 1974 after 362,601 coupes and 80,881 convertibles were built. The prototype that debuted in Paris is part of a private collection but it is occasionally displayed at Volkswagen events throughout Europe. I was heading South on the Jersey Turnpike in the early 60s when it happened. It was maybe 2AM Monday morning and I am driving my 57 Pontiac Star Chief a little faster than the speed limit…. Mine is practically the only car on the road, I am heading back to my ship at the naval base in Norfolk, VA. As usual I am using 110% of a three day weekend at home in Vermont. The Star Chief could cruise forever at ninety mph, at least empty…. Going home on Friday I had a 500 pound load of potatoes in the back seat area so I had to go slower. My Navy pay was only $76 a month back then, so I bought fresh picked potatoes in Virginia and sold them in Vermont where the new crop would not be ready for another month. The profit from the potatoes paid for my gas and tolls and I had $50 left for the weekend. Back to that night on the turnpike. There had been no lights in my rearview mirror for some time when I noticed lights slowly gaining on me from a long way back. I slowed down a bit but knowing the cops didn’t bother you much that late at night I didn’t slow a lot. It was not long when the vehicle behind me pulled into the fast lane and slowly passed me on the left. It was not a cop or an ambulance; it was a VW Karmann Ghia. I was able to talk to the gent in the Ghia a ways down the pike at a truck stop and found the little car had only it’s original 40 hp engine! I vowed that someday I would have a Karmann Ghia. Jumping ahead a few years, it is now 1971. I am out of the navy and back in Vermont working electronics for a local cable TV company, I am married and have two lovely young daughters. I am minding my business one day while driving by Smiley’s used car lot in Georgia,VT when I spot a robins egg blue Karmann Ghia. It was a 68 coupe fresh from a 4X4 trade with an Air Force gent being transferred to St. Albans, he had bought it new in Mississippi and needed something the he could drive in our winters. You can guess the rest, Smiley and I made the $700 deal and I drove it home a few days later. You had to sit slightly sideways with your feet to the right and the tiny foot pedals made for some tricky foot-work but it was fun to drive. The only problem was when I got on the interstate I could only get maybe 70MPH out of her and there was no more. That is when I determined I needed to get rid of the automatic transmission and the AC. With only 44 HP to start with there was not much left for the rear wheels to use. A transplanted standard shift and nixing the AC did the job…95 to 100Mph was now reachable alt-hough I was, by then, a responsible married guy and I didn’t do high speeds any longer….. well, not as often. Again, jumping ahead to 2014… (life sure has a lot of ‘jumps’). My Karmann Ghia is parked out in the barn patiently waiting for me to get over my obsession with cars from the 1920s so it can get back on the road again. It was my main driver for 12 years and a lot of nice adventures happened during that time. How many of you are thinking about my possible mistake of getting rid of the automatic transmission and the AC? The part you are missing is the 12 years that I drove it with all of those 44 horses. That is the part that makes my decision all-right! Can you imagine how deeply feelings can be affected from comments like this? It just goes to the bone… hah… frame, but my Dodge can take it! Those other cars, well, we will not go there, because my Dodge has manners. The quote you read on the front page came from a respected VAE elder after spending the day in the Dodge, traveling the mountainous back roads in central Vermont. He was correct, in a way. There had been a few vaper-lock problems… well, quite a few; then the split rim problem that happened on the way down a steep hill and compromising the braking… a bit. The clutch also gave a few grunts during the day. The problems did in fact happen one at a time but don’t you think he could have made his comment a little more delicately? The quote above came from one of those Plymouth guys all puffed up with his shiny paint job… oops, must remember, manners. The 1927 Dodge with the Fast-four engine can be traced as far back as Pennsylvania but with very few details. A gent near Mystic Conn. bought it in Pensy and then sold it to me when he needed to down size. There were real tears in this big guys eyes as we left with his car on our trailer. That is how these old cars get to you. They can make huge and great memories. I have had it only a few years now but I can go on for hours telling adventures “we” have had. I started finding babbit material when I changed the oil and some VAEers with more experience than me could tell there were problems with the engine. I spent my career in electronics and had never ‘rebuilt’ an engine. Grinding valve seats, new rings, new bearings… that was always very mysterious to me. With a lot of encouragement from fellow members I decided to give it a try. As you can see from the pictures, the end is insight. If I have not forgotten something and if all goes as planned, there will be quite a day not long from now when I will hear that engine come to life. I can’t imagine yet what a great day that will be… and I will have another “adventure” to tell! Let me see if I can tell you about one of these ’adventures’ we have had. There was the weekend we (the DB and I) joined a VAE tour to the Northeast Kingdom of Vermont. And a great tour it is was! I had found my two mechanical rear brakes were not up to par so an ‘elder VAEer’ (there are a lot of them) agreed to follow me home via Canada where the terrain is flatter. Crossing back into the U.S. I had not been able to stop soon enough at the border crossing and was getting bald-out by an official for my transgression. The official was overdoing it a bit and I could hear the ’elder’ behind me making snide remarks about the scolding. No matter how much I motioned with my “left-turn-signal hand’ the elder continued… ”I knew him as a kid and he was a jerk then also” was one of many. The only thing that saved us (the DB and I) that day was when the official turned smartly for his control shack and smacked his head loudly into the stop sign I had gone through. The laughing behind me was deafening. Within minutes the DB and I, with the elder following, were on our way home.